Although “going green” seems to be one of the common catch phrases for the past few years, Global Environment Outlook has reported that “significant progress [has been] seen on only four out of 90 environmental goals”. This means that we need to stop thinking of “going green” as just a passing fad but as a lifestyle that we all need to adopt. I know that most of us shut down when we hear the doom and gloom reports on how unsustainable of the current path of humanity is. We think, “It is too late to fix such a large problem” or “What can I possibly do to make a difference?”. Trying to tackle these issues in your own life can seem impossible and overwhelming. As we all know, the average American lifestyle is not very conducive to a creating a symbiotic relationship between humans and nature. Known for our our love of gas-guzzling hummers, exorbitant food portions (which leads to unprecedented waste), and our pursuit of “The American Dream” which includes a large house (with many more rooms than we could ever use) on a sprawling estate, we are unquestionably headed towards the ominous “tipping point” that many scientists have warned against. Although efforts and some progress has been made in changing the national mentality, many people still find the though of changing their lifestyle and letting go of this American ideal to be daunting. But here is the good news: You don’t have to give up the American dream to live in harmony with the environment! You can still have the home that you visualized for yourself. You can have that perfect space to entertain, indulge your love of cooking with a fully-equipped kitchen, have a comfortable place for mom to sleep when she comes to visit, have your own home office, and do it all with style! What’s even more exciting is that it requires much less space and money that you would think so you don’t have to be a millionaire to get what you want out of your living space. We know how much you love the chic versatility of Jia’s designs, now your home can be as streamlined as your wardrobe. We have scoured the internet to find the top five blogs and websites that can share their expertise for those who seek an environmentally-friendly home with the best utilization of space. Live Screen by Danielle Trofe (left), Urbio (right). Life Edited believes that the key to removing mental clutter and restoring tranquility is to have a beautiful and organized home. Jia knows, especially for her fellow New Yorkers, that this isn’t an easy task. With space and budget limitations, creating a modern yet functional space is a definite challenge. This blog is a goldmine of tips on how to make your home more utilitarian and beautiful at the same time. We love the sleek and modern products featured on this blog. Like us, they value quality products that will make your life run smoother as well as being attractive. Their Pintrest account, is a cornucopia of fabulous finds, we are especially infatuated with the vertical gardens that they posted (shown above). We lost track of time clicking on the article topics at Life Edited! Just reading them made us feel more of a spiritual connection to our abodes. Articles found on Life Edited include such gems as: 8 Tips for Editing Your Life that Work for Any Budget, and 5 Shopping Tips for Buying Less Stuff. We never realized just how much more efficient and exquisite our homes could be, and they make it seem so easy to achieve! Life Edited was started by Graham Hill who is also the founder of Tree Hugger. Hill is our hero! He is living proof that “going green” doesn’t mean you have to move to a commune and start making your own compost. He has dedicated his life to proving that you can live (and live well!) with much less then you think. Hill makes very compelling arguments as to how this lifestyle just makes more sense and is ultimately more conducive to residing comfortably in an urban environment. His 420-square-foot apartment, which he refers to as a “Multipurpose Laboratory” can be transformed into six different rooms! You can see the phenomenon unfold in this video. 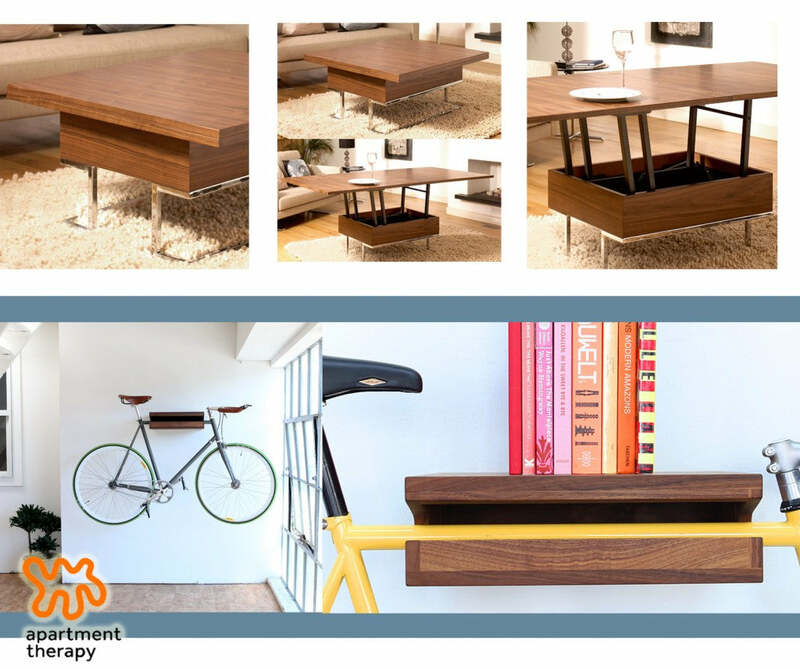 LGM Space Saving System by Resource Furniture (top), Goliath Table also by Resource Furniture (bottom). 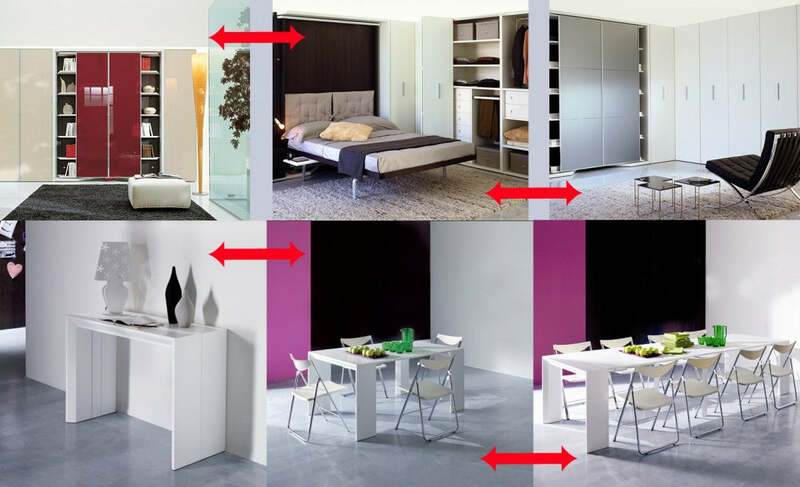 Resource Furniture is passionate about bringing you the best furniture for optimizing the layout of your home. They also have great videos such as the one shown below which will revolutionize the way that you think about your home. “Most families rarely use the guest room and the dining room is only used for a short time each day”, they point out, “Instead of letting all of this valuable space go to waste, wouldn’t it be nice if these two spaces could be combined into one big recreation room?”. This fun video shows how so much of your furniture can become multifunctional and you can impress your friends with your gorgeous space-age digs. If you want to know more about what Resource Furniture has to offer, you can check out this video to learn about more incredible products to add to your shopping list. Hydraulic table designed by SKF Group. What we love about Dwell is that their mission is to make modern interior design more approachable. Most interior design magazines are filled with pristine rooms devoid of any signs of life. While these rooms are attractive, they are also cold and intimidating. Dwell aims to prove that you can make your home as elegant as a showroom while actually being able to live in it. This philosophy coupled with the tips in the Going Green section makes this site a go-to for re-imagining your living space. We also found this inspiring article called Stow Aways about a couple who made their 650-square-foot Chelsea co op into a comfortable oasis optimizing every square inch of their home (pictures shown above). Another great feature of this site is the Dwell Labs section in which readers submit their design challenges and the Dwell experts offer smart solutions. We like how interactive this makes the site and they solve such pressing issues as, how to organize all those unsightly cables in your home, stylish solutions for separating your recyclables, and clever alternatives to the traditional coat rack. 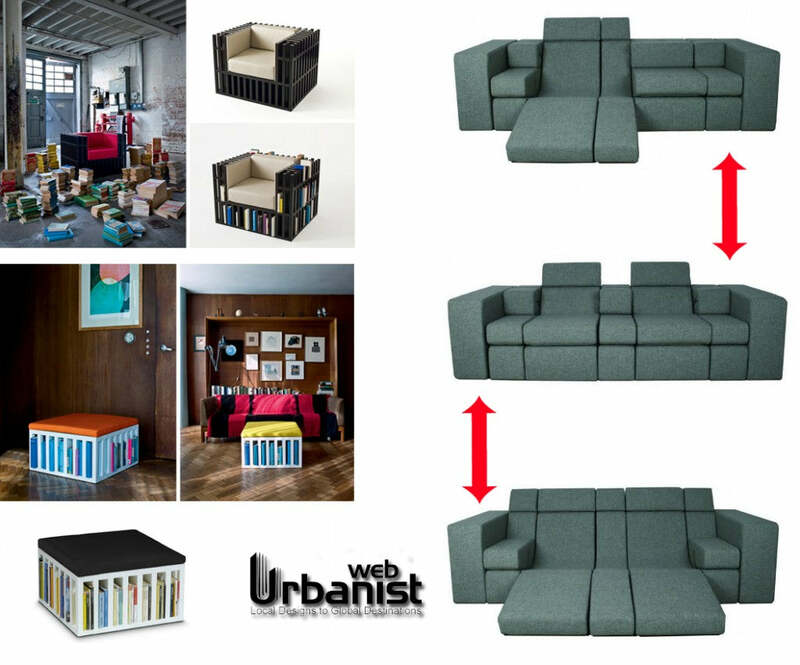 Chair/Bookshelf and Ottoman/Bookshelf by Nobody & Co. (left), Convertible Modular Sofa by Svenik (right). Web Urbanist spotlights innovations in architecture, art, technology, design, and global culture. This site features cutting-edge furniture designs that range from crazy conceptual to every-day chic. With and endless supply of eye candy, they feature numerous convertible furniture designs to help streamline your interior with flare. We are especially enamored with these chairs and ottomans we found that also double as bookshelves. They are so adorable and an ingenious alternative to some of the ungainly traditional bookshelves that take up valuable space. When you are ready to leave to your impeccably decorated home, Web Urbanists give you tips on the most amazing places to travel. We were awe-struck when we saw the photos that they posted of Mexcaltitán. This blog wins the award for making our hearts skip a beat! Convertible coffee table from Dwell. Bike rack/shelf by Knife & Saw. “A calm, healthy, beautiful home is a necessary foundation for happiness and success in the world”, proclaims the good people at Apartment Therapy and we couldn’t agree more. The mission of this blog is “To connect people to the resources they need to improve their homes, while reducing their reliance on stuff”. We are inspired by how they continually accomplish this lofty goal with elegance. Apartment Therapy fits perfectly into the streamlined lifestyle that we aspire to. Like Dwell and Life Edited, this blog makes the task of recalibrating your thinking about “green” and simplified living much more approachable. Reading through this blog made us feel as if we were visiting with a close friend. There was no pretense, no scolding for our current lifestyle, just a benevolent hand to guide us in the right direction. They are perfectly in tune with Jia’s sophisticated customers who appreciate luxury but also want to get the most mileage they can with their money. With an eye for simplistic and modern design, a little help from them and your apartment can reflect the inner you along with your wardrobe!